The 100-pax Silver Origin is purpose-built for the Galapagos islands. 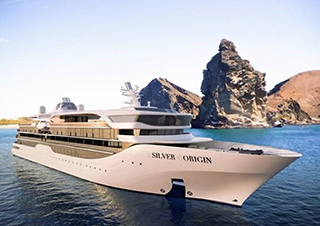 Silversea has released new details about Silver Origin, its first-ever destination-specific ship, being designed and built to tour the Galapagos Islands from summer 2020. The luxury line says Silver Origin cruises will combine luxury, sustainability and local destination expertise. Guests will discover the islands through on-shore activities led by Silversea’s Expedition Team -- certified by the National Park of the Galapagos -- as well as enjoy Ecuadorian culture on board through lectures, videos and authentic local cuisine. The 100-passenger, all-suite Silver Origin promises the highest crew-to-guest ratio (1:1.16) and the highest ratio of qualified guides per guest (1:10) in the Galapagos Islands. Several spaces and lounges will provide venues for education and discovery, socializing or just taking it all in. 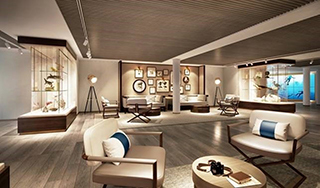 The “Basecamp” will host destination-driven educational activities, while the ship’s Explorer Lounge, with floor-to-ceiling windows for sweeping destination views, will host daily briefings and lectures from the ship’s Expedition Team. It will also double as a sophisticated space where guests can relax with a bar and piano. Silver Origin will feature eight suite categories, with the Owner’s Suite being the largest. While all suites include a private balcony, certain categories feature a Horizon Balcony, which can convert to enclose the balcony with a floor-to-ceiling window for added space and better shelter from the elements. 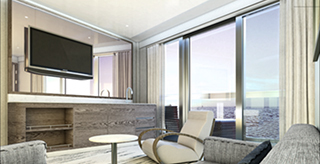 Plus, in a first for Silversea, selected suite categories will incorporate an ocean-view bathtub, as well as an ocean-view shower accessible from the balcony for guest convenience and comfort. Silver Origin is also the only ship in the Galapagos to offer butler service to all suites. The ship will have two dining venues, which will be able to accommodate all guests at full capacity: The Restaurant and The Grill, the latter of which is an open-air venue that can be partially enclosed for comfort. Both restaurants will use fresh, local ingredients for their international cuisine paired with regional wines. With Silversea’s all-inclusive approach, guests will enjoy complimentary drinks throughout the ship. The cruise line says that Silver Origin will be one of the most environmentally friendly cruise ships ever built. Apart from being energy-efficient, having an advanced wastewater treatment system and reducing single-use plastics, the ship’s dynamic positioning system will allow it to automatically maintain position to help protect the sea floor.